We’ve all seen them. Maybe you’ve even posted a few yourself: memes and hashtags declaring the endless difficulties that plague our modern lives. Out of coffee! The struggle is real. The power went out for a whole hour! The struggle is real. You want a beach body, but you want tacos more? The struggle is oh so very real. And while I know the phrase is meant to be funny and (hopefully) facetious, it seems that we have actually lost sight of what struggle really is—and more importantly, the benefits that God intends for us to derive from struggling. In our current era of parenting, this confusion has become especially evident in the way that we try to shield our children from experiencing any negativity in their lives. I think it’s safe to say that we all want the same basic things for our children. As Christians, we want them to know Christ. We want them to be safe. We want them to be successful. We want them to be “happy and healthy.” Happiness and health are good things, and they are unquestionably blessings from God that are to be enjoyed, however, there is a better, higher goal. We should strive to raise children who become mature, godly adults who are able to negotiate this broken world without falling apart and losing their faith at the first sign of failure. If our goal is happiness, we will find ourselves becoming “snowplow” parents constantly pushing any and every obstacle out of our children’s way, or “helicopter” parents hovering over our children, overseeing every detail and decision of their lives, stepping in before they can make a mistake. Ironically, neither of these approaches ultimately produces happy children. On the other hand, if our goal is maturity, we become parents who see the need for our children to endure unpleasantness, knowing that it will ultimately result in their good. This is what brings about a true happiness. Struggles, or trials, can be anything that test a person’s endurance or forbearance, or they can be difficulties that stand in the way of achieving a task or goal. Sometimes trials are major: a cancer diagnosis, financial crisis, job loss, etc. Usually, however, our trials are seemingly minor, yet constant: annoying people, sticking to a schedule, loving our enemies, treating others the way we want to be treated instead of the way we have been treated, laziness, ignorance, homework, completing mundane tasks, not trusting our feelings, not being reactive, etc. The list is unending. James tells us that as a result of enduring struggles, we become better people. He calls it “perseverance.” We can think of perseverance as having tenacity, steadfastness, patience, determination, and grit. Persevering people are able to do things they don’t want to do while still having joy. James tells us that we have to let perseverance grow in us so that we can become mature. James couples “maturity” with completeness, and a lack of nothing. Being mature means having the ability to make wise decisions regardless of one’s feelings. It is knowing the right thing to do in any given situation, and when faced with a lack of wisdom, asking God. Mature people are not easily swayed. They stand firm in their faith. They are not tossed about like a boat on an angry sea. They are stable. They are strong. Clearly, in God’s estimation, struggling is an essential part of His plan to make us more like Christ. If our perfect Heavenly Father insists that we need to struggle, then, as earthly mothers and fathers, we must likewise follow his example and insist that our own children struggle. So, how can we ensure our children enjoy a healthy level of age-appropriate struggle? The Harvard Grant Study, a continuing study that has been following two groups of men for the past eighty years, recently concluded that the single most important variable to success in adulthood was whether or not the person had childhood chores. However, a study by Whirlpool (corroborated by an annual series of informal surveys given to my third graders) says that only 28% of American parents regularly give their children chores. I get it. Our days are overscheduled and our kids are overstimulated. Between the assigning, the instructing, and the ensuring they follow through, it all seem like more trouble than it’s worth. But, it is worth it, and the earlier you start, the better. Your children are capable of doing nearly anything in the house that you can. The same arms that hauled the toys out of the bin can put them back in. The hands that can carefully carry around an iPad can carefully carry dishes to the dishwasher. The motor skills required to fold paper airplanes are the same ones that are needed to fold clothes. If they can swing a bat, they can swing a broom or a rake. If they can scrub themselves in the shower, they can scrub its walls. You get the picture. Chores probably won’t make your children very happy, but they will make them responsible, independent, and capable adults. Make them responsible for their own homework. Homework is your child’s responsibility, not yours. If you want a responsible middle schooler that does their homework without you even knowing they have it, start in first grade. Establish a routine in which your child knows that they cannot have their own time until their work is done. Don’t hover. You have things to do. Do them! If they get stuck and need help, they can ask. When they are done, they should bring it to you to check over (if necessary), but overall, it is their responsibility. Don’t resolve their conflicts for them. We are definitely our children’s greatest cheerleaders and advocates, and that’s a good thing! However, as they grow, we have to learn to step back so that they can step up and gain the people skills they will need the rest of their lives. Don’t spend your days calling and emailing on behalf of your children. If they want more playing time in a sport, teach them how to respectfully ask their coach how they can improve. If they don’t understand why they got a grade, teach them how to respectfully ask their teacher to explain. If they forgot something at home, don’t drive back to school to give it to them (or at least don’t make a habit of it.) If they aren’t getting along with a friend, give them ideas about how to resolve the issues. Listen to their problems with empathy, but don’t take it upon yourself to fix them. If they decide not to speak up, they will have to deal with the consequences. Give them opportunities to practice potentially uncomfortable social skills. In a society where we increasingly communicate with screens more than humans, interactions with strangers can feel uncomfortable. Some children will need extra practice with this. Send your children into the grocery store to make small purchases for you. Make them ask the librarian themselves when they need help finding a book. Have them order their own food at restaurants. Teach them to embrace failure. Ever since Apollo 13, a favorite American motto has been, “Failure is not an option!” Talk about an impossible standard! Teach your children that not only is failure an option, it is a given. I mess up every day, and I make sure my children and my students know it, no excuses. I fail with people, I fail with facts, I fail to keep promises. Let your children fail in the small things. Let them learn what it feels like to feel inadequate. They will learn that life goes on, and rarely are things as bad as they seem. If they never have to struggle through the pains of small failures, they won’t be able to cope when the big ones come. Diligently teach them that through all of our failures, God is faithful. Struggles are, by definition, hard, and we just don’t like hard things. They’re often emotionally, physically, socially, and spiritually draining, but God promises us in Romans that He will make good from all of these things. Perhaps the reason we don’t let our children struggle is because it hurts us to see them hurting. That is certainly the case when it comes to interpersonal conflicts and failures. But perhaps more often it’s because we ourselves don’t want to struggle. We don’t want to endure the never-ending work, to set the expectations, to be consistent, to follow through, and to patiently deal with the grumbling that comes when the children have to struggle. I know that is too often true of me. However, these are the struggles we must endure for the sakes of our children. The good news is that God has already promised us that from these struggles He will grow our perseverance, making us more like Christ, until we are complete in Him. The calling is high, and the stakes are higher. Mrs. Terri Covil serves as a third grade teacher. She holds a B.A. in Religious Studies from the University of North Carolina at Chapel Hill. 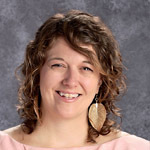 Mrs. Covil began working at CCS in 2013. She has been married to her husband, Patrick, since 2003. They have two children, Chloe and Elijah, who attend CCS.